Fall is an incredibly beautiful time on the North Shore. Fresh lake breezes blow in from Lake Superior and the hills are ablaze with color. Maple leaves (which are typically found inland) begin to change from green to fiery shades of orange and red while the aspen, poplar and birch trees add to the display with vibrant shades of yellow. If you're looking for a destination for fall color drives, the North Shore is it! Some of our favorite routes are below. This 4-mile route passes over a series of Amity Creek bridges. 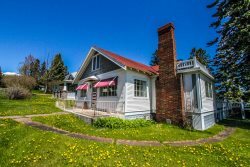 The road starts at Lake Superior and follows the cascading creek up to the top of the bluffs where you’ll see spectacular views of Lake Superior. Follow highway 61 from the east side of Duluth all the way to Grand Portage, or just travel sections of the road. You will pass by many beautiful vistas overlooking Lake Superior and the Sawtooth Mountains. Stop at any of the popular North Shore destinations along the way and you’re sure to find bright colors from maple, aspen/poplar, birch, tamarack and/or oak trees. This route goes up and down US-Highway 61 through a valley of trees, passing through a unique and beautiful territory. Travelers should keep their eyes peeled for wildlife like deer, moose and wolves. Drive through a beautiful canopy of maples on this short, but breathtakingly beautiful, route. This 15-mile route between the Sawbill and Caribou Trail takes people down an old railroad grade that was used when white pine was logged in the area. It is an excellent drive to take any time of the year, but especially during the fall when the leaves are changing. Watch for moose - some have been spotted on this route. Maple trees line this short route which takes drivers by Maple Hill Church. It is a great choice for an early season drive. This is an excellent gravel drive outside of Grand Marais for viewing sugar maples in the early fall season. There are many spots along the route, including public lake docks, where you can stop and get out of your vehicle to take in the season with all of your senses. The leaf change typically starts mid-September and will last through mid-October, with "Peak" usually happening at the end of September or first week of October. If you are planning a last minute trip to see the color change happening, check out the Minnesota DNR's Fall Color Finder for an up-to-date map on when and where leaf changes are being observed.